An FTC Scrimmage is an opportunity for Teams to get together and practice competing with their robots. We’ll have the Velocity Vortex field set up and we’ll run practice matches and talk about what a tournament is like and how to prepare for it. 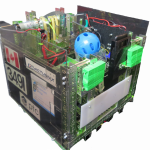 Even if your robot isn’t ready, bring it and you can work on it and get help from mentors and other teams. Note: This is the building beside where we held the BC FTC Kickoff event.